Women’s March to Ban the Bomb a super success! 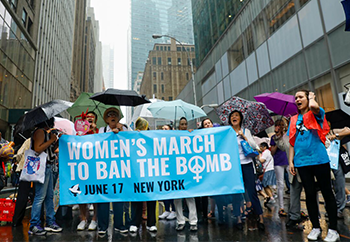 On 17 June WILPF and its partners hosted a total of over 150 diverse actions all around the globe to mobilise public opinion for the ban on nuclear weapons. The Women’s March to Ban the Bomb has been a resounding success and shown again the power of women’s leadership to take positive action and face down adversity. In New York City, where the primary event took place, nearly 1,000 committed activists came out to march despite heavy rain and wind. WILPF staff kicked things off with a brief rally near iconic Bryant Park, and then marchers moved across midtown to Dag Hammarskjold Plaza, across the street from the United Nations. The President of WILPF International, Kozue Akibayashi, welcomed the determined crowd, by sharing what it is like to be in Japan 70 years after the dropping of the atomic bombs on Hiroshima and Nagasaki. “You can hardly see the remnants physically there. Even Japanese people think it is the past. But the impacts on people particularly on health have continued even through generations. Second or third generations of Hibakusha still live in fear and we do not know exactly how to cope with it. It has been too long.” She was followed by a powerful line-up of women activists and performers. Live video coverage from New York is available online. Photos can be found by visiting WILPF’s Flickr album, as well as through the WILPF and Reaching Critical Will Facebook accounts. 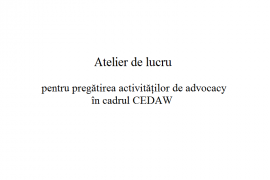 Many WILPF Sections mobilised in diverse parts of the world! 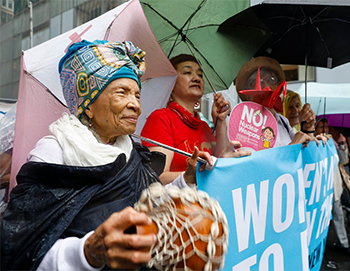 In Australia, WILPF and partners organised a day of action that saw rallies, protests and other actions in major cities across the country. WILPF Cameroon hosted a solidarity event on 15 June that generated inspiring photos of members and supporters holding signs in support of banning the bomb across Twitter, Facebook and in media. 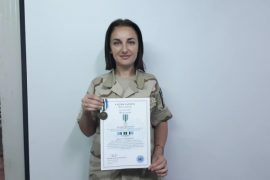 We saw expressions of support from WILPF members and Sections in Italy, Nigeria, Ghana, Afghanistan, Scotland, and the United States, among others. The marches may be over, but the work continues. 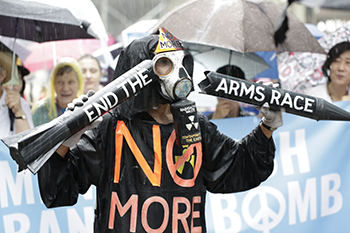 The negotiations of the nuclear weapons ban treaty continue in New York until 7 July. The best way to follow the talks is to subscribe to the Nuclear Ban Daily, published by WILPF’s disarmament programme. They are also live Tweeting from the meetings – look for @RCW_ or @nuclearban. Relevant hashtags are #nuclearban and #womenbanthebomb. We will also be collecting and sharing photos, quotes and stories from all of the solidarity actions in the coming days and weeks, so please continue to follow us on Twitter (@WILPF or @WMTBTB) or Instagram (@WILPF or @womenbtb) as well our websites.